Sometimes a last minute topic change actually goes somewhere. 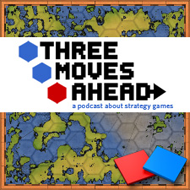 Troy, Tom and Bruce have a long and detailed conversation about the challenges wargame and strategy game designers face when they try to capture the essence of an historical moment. How do you model insurgency? What makes WW2 the default combat model if not the default topic? Why are Tom and Bruce still scarred by Combat Mission Shock Force? Also a discussion of reading material, how Twilight Struggle works, and whether Balance of Power is a terrible game. Then a long update on Dominions 3 and why Bruce is afraid. The next mini-game series from ProSIM is on Operation Iraqi Freedom, although I’m not sure if it will cover past the initial invasion. There is a board wargame that leans towards a simulation of post-invasion Iraq dealing with counter-insurgency operations and the factional clashes being worked on, but I can’t recall the title, nor can I remember who is publishing it. Did a search but came up with nada. But it’s out there. I think the most successful games dealing with COIN end up being tactical games. Ambush Alley is a great miniatures system dealing with COIN operations in Iraq. Mosby’s Raiders, a solitaire board game from Victory Games (not the recent computer game) is another good example. As a side note, doing COIN gaming as solitaire systems is probably a decent idea often it’s about a mobile force hitting a static (or semi) force which can be ran by the system itself. I suppose you could also argue that AWI games do a good job of modeling insurgent warfare on the strategic level such as 1776 or We The People. Regarding the concept of “too soon” with simulating conflicts I think the only people who have a problem with them are your typical liberals who aren’t interested in playing them in the first place. Amongst wargamers I have never encountered anyone who had any problem gaming a conflict, other than just simply not having an interest. I mean, the Aliens were invaders, but the way they acted was quite like an insurgency – you have to keep track of hidden levels of subversion, and groups of aliens who would move around the map whilst hidden. I don’t think the strategic parts of it are very deep though. The main problem is that the interesting issues in fighting an insurgency is not the military strategy aspect of it. A counter insurgency agent is essentially reactive, and can be boiled down to ‘hit them whenever you see them’. The more interesting part is the more detailed micro-level of infiltrating the insurgency, moral dilemmas, tactical combat, hearts and minds and so on. Which is really probably more suited to a RPG. Personally I think there shouldn’t be any reservation when modelling wargames or even action games based on current conflicts. I see it as no different to TV celebrities joining forces out in Afghanistan and following their lifestyle and movements (see Ross Kemp in Afghanistan for instance). During filming named people die, and that has to be shown to bring the reality of it back home to the viewers who are not directly involved in the conflict. A game can treat a conflict sensitively even in its abstracted form, its the way its presented, I guess, that is the important factor. Again skirting around the strategy to some extent, I’d like to see more conflicts presented as experiences similar to the way that WW2 has been done with the First Person Shooter. I’d personally like to experience WWI in the trenches (without the Necrovision Zombie treatment), I’d like to experience The American Civil War, The Peninsular War, and even Ancient warfare from a action based tactical perspective. I wondered what the panel think about action shooters such as the Brothers in Arms series (or Full Spectrum Warrior series), given that they’re played out more at the tactical squad level, and do involve a certain level of real time strategy. I think there is scope for a strategic level game to span the drier chit shuffling you do on a conflict map, down to allowing play at the grunt level, to experience the conflict from a personal perspective. I feel this would not only enrich the whole appreciation of the conflict modelled but also give you more of an ‘experience’ or glimpse at what it is like to be embedded in the action. Looking forward I suspect our wargames will become even more abstracted by the technology that is used nowadays that certainly distances the combatants from the human slaughter. This ability to take part in a game at any level of the command hierarchy, from strategic commander, through to grunt with gun would be a fascinating game to play, and one which might swing strategy gamers into experiencing action games, and action gamers taking it to a higher level of strategy. There was an RTS years ago that allowed you to command and take part at the troop level, Battlezone (or Battlezone II) I think it was called, and I truly thought that was going to be the future of RTS’es. Several other games have attempted this, some where you lead squads around a battle map, influencing the conflicts at key points, but with action orientated combat.. Dynasty Warriors and Bladestorm are the ones that spring to mind. Dominions 3 tease from Bruce! Put us out of our misery Sir! Someone, give us a visual representation of what’s happening, or some insights into army builds etc.. I’m sure theres plenty besides me just gagging to add more flesh to the strategy that is unfolding in between the few choice words we get at the end of the cast. Wow, I hadn’t thought about Conflict (the second, strategic one) in years. Simple, simple game, but surprisingly engaging, at least in small doses. Alas, I also remember it being fairly buggy, not to mention opaque in the “rules” department (you never quite knew what to do, the effects of what you did, etc.– all very random). Still, nothing quite like it today, for shame. Sounds a bit like MAG on the PS3, although it’s not clear yet quite how strategic it’s really going to be. Thinking more about the podcast today something that I think might make an interesting topic for a future broadcast would be the question of how cohesion and morale in general is modeled in strategy/war games. Close Combat is about the only series that I can think of that tried to simulate morale at the individual level. A few games out there do basic morale mechanics, but even in board gaming morale is usually regulated to maybe unpinning a unit. The First Battle series had rules for sides losing cohesion due to leader casualties, and I know a lot of ancient games also tend to go along those lines. There’s also the question of national morale; the war will. I really can’t think of any strategic level game that models war will and weariness. But overall I think for such an important aspect of combat (especially in terms of COIN) it is far too often either simplified or ignored altogether by designers. A little wonky for most of our crew, Scott, but I like the idea of delving into little mechanics like that and not just systems in general. The whole idea of morale and unit cohesion is an interesting one design and play-wise. Glad to hear Bruce back on. The four of you are like the Mount Rushmore of Strategy Gaming Talk. If a mountain side was to be carved out in the panel’s likness, I could see Bruce insisting that Tom be represented by a hammer and sickle! Tom mentioned Call of Duty 4 as a good representation of more contemporary war, which I agree with completely. However I’m shocked that he didn’t bring up Full Spectrum Warrior as it is truly a strategy game and fits into the show theme much better than CoD4. If you never played FSW I think it would be worth your time to check out. It was a pretty good game in general and the only strategy game of it’s kind on a console (that I remember). Planning your squad movements, flanking, cover fire, and never actually firing a weapon yourself made for a fun and strategic game set squarely in a contemporary Middle Eastern warzone. If yo0u have played it I would love to hear you thoughts.